I'm sure you've already heard, but that unstoppable category 3 terror they're calling Irene is threatening to make her way towards New York City. I can't even begin to tell you what a pain this is, especially now. Come on, Irene, it's the weekend! One of only two left in the whole damn summer! So. Rude. I mean truthfully, I'm probably not going to spend too much time outside when Irene decides to make her whirlwind tour of New York City. If it's necessary though, I'll pretend a small umbrella won't get turned completely inside out, throw on a borrowed Barbour jacket, some jorts and Hunters, and make a run for it. Where could I possibly need to go? That's yet to be seen, but Duane Reade, and Spice seem like the only realistic places. For staying indoors all weekend, even though it's not particularly chilly, I'll still cozy up in a soft sweater, PJ pants and moccasins, and give myself a manicure while drooling over Kate Moss' wedding photos. I mean, right? 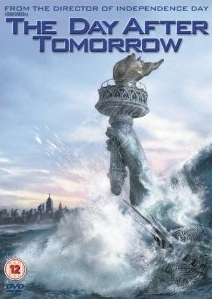 I don't know why you wouldn't watch an epic natural disaster movie based in New York City while an actual natural disaster approaches our fair city. It's Jake Gyllenhaal and Dennis Quaid vs. Mother Nature. It's awesome. And you get the perfect Hurricane Irene cocktail - a Dark 'N' Stormy! I'm pretty sure that a themed cocktail (or three) is exactly what's in order to ride out this crazy weather. Seriously though, all my East Coast friends, pay attention to the news, stay safe, and find a floatation device. love the idea of bright, yellow Hunters and a themed cocktail to get you through the storm!